2. Select fully ripe cherries. Sort, wash, and remove stems; do not pit. 3. Crush cherries, add water, cover, bring to boil quickly. 4. Reduce heat and simmer for 10 minutes. Extract juice by pouring into a damp jelly bag and suspend the bag to drain the juice. The clearest jelly comes from juice that has dripped through a jelly bag without pressing or squeezing. 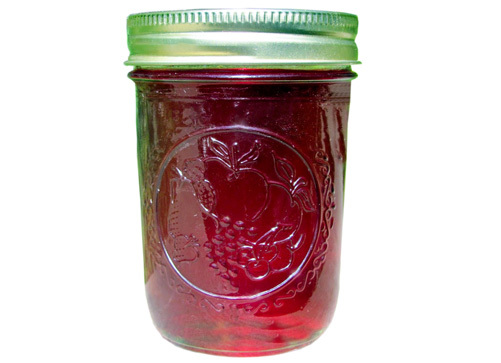 If a fruit press is used to extract the juice, the juice should be restrained through a jelly bag. 5. Measure juice into a kettle. Stir in sugar. 6. Place on high heat and, stirring constantly, bring quickly to a full rolling boil that cannot be stirred down. 7. Add pectin and heat again to a full rolling boil. Boil hard for 1 minute. 8. Remove from heat; skim off foam quickly. 9. Pour hot jelly immediately into hot, sterile jars, leaving ¼ inch headspace. 10. Wipe rims of jars with a dampened clean paper towel; adjust two-piece metal canning lids. 11. Process jars immediately in a Boiling Water Canner according to the recommendations. Let cool, undisturbed, 12-24 hours and check for seals.